and wanted to use the technique in my next creation. 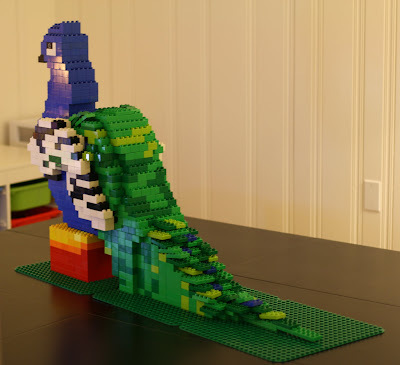 I thought that it might be fun to use lifted bricks to create a feathered effect. This brought me to the peacock. As a child, I had only seen peacocks wandering around the New Orleans Audubon Zoo. I had never really thought about them in the wild until my husband and I watched a video about the tigers in India. There was an incredible shot of a peacock perched in a tree at sunset. The sky was bright orange, and the trees and bird were in silhouette. The bird's tail feathers dripped off the tree branch, and in one sudden and graceful movement, the bird flew to another tree in the forest. I will never forget that image and the startling realization that there are forests filled with tigers and wild peacocks. How could such a large gaudy tail not be an incredible liability in nature? Of course, I am glad that it is not. They are stunning birds. OMG. These are amazing! Where did you go? Come back and post mooooooore!!!!! Thank you so much! You have made my month!!!! I am hoping to post something soon. I have been delayed with house repairs, a bat invasion, and DUPLO structural collapses. Thank you again. Marie.